Most of us keep our eggs in the fridge, despite the fact that they are best kept at room temperature in a basket, rack or nest. 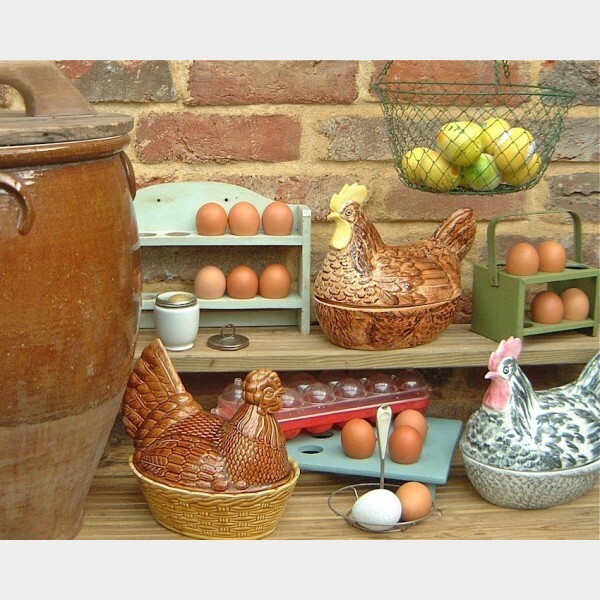 Terracotta egg crocks were the favourites of pre-Edwardian Britain with solid terracotta or wooden lids. They were cool and rodent-proof ! Eggs were usually sourced locally, but railway comapnies produced special boxes for transportation. 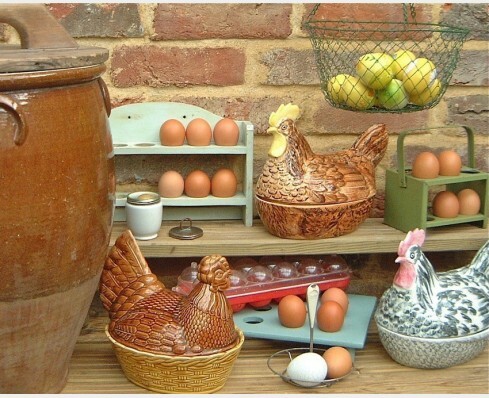 The smaller domestic version of the giant egg crocks is the chicken nest.. Most were designed to hold a dozen eggs and potteries would often replicate the treacle glaze, although other colours were used. Wall-hanging or self-standing racks in wood or tin have been used through the decades, as have hanging wire baskets. By the fifties egg boxes made of plastic and in bright colours were becoming popular.